Objectives: It is well accepted that survival after a second organ transplant without immunosuppressive agents indicates tolerance for the first transplant. To validate donor-specific tolerance, we established arat model with a secondary heart transplant after intestinal transplant, which has so far not been described in the literature. Materials and Methods: We transplanted intestine from Fischer F344 rats to Lewis rats orthotopically. Lewis rats received tacrolimus pretreatment before trans­plant and a 14-day course of rapamycin 1 month after transplant. 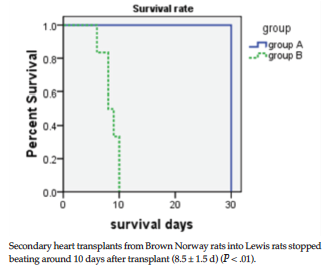 At 120 days after primary intestinal transplant, hearts from 6 F344 rats (group A) or 6 Brown Norway rats (group B) were transplanted to Lewis rats that had survived intestinal transplant and without additional immunosuppressive agents. We analyzed survival data, histologic changes, cells positive for the ED1 macrophage marker in trans­planted hearts, and 3 lymphocyte levels in both groups. Results: Thirty days after secondary heart transplant, group A hearts were continuously beating; however, group B hearts stopped beating at around 10 days after transplant (8.5 ± 1.5 d; P < .05). Our histologic study showed that both groups had muscle damage and cellular infiltration in hearts that were distinctly different from normal hearts, with ED1-positive cells counted in both groups (85 ± 16 in group A, 116 ± 28 in group B; P > .05). Fluorescence-activated cell sorting showed that CD4/CD25-positive regulatory T cell, CTLA4/CD4/CD25-positive regulatory T cell, and Natural killer T-cell levels were significantly higher level in group A versus B (P < .05). Conclusions: The donor-specific tolerance that we observed was possibly a state of “clinical tolerance” rather than “immunologic tolerance.” Our rat model is a feasible and reliable model to study donor-specific tolerance. The higher levels of lymphocytic T cells shown in intestinal transplant recipients were associated with longer allograft survival, possibly contributing to donor-specific tolerance. With improvements in surgical techniques for organ transplant, graft rejection has become the main concern. The ultimate goal of transplant is to render genetically disparate organs or tissues to be accepted and regarded as “self” by recipients so that chronic immunosuppressive therapies are no longer needed. As immunosuppressive agents, tacrolimus (FK506) and rapamycin are both macrolide antibiotics and bind to the same intracellular protein: FK binding protein 12. The difference is that the tacrolimus protein inhibits T lymphocyte immune response via bloc­kade of calcineurin phosphatase and the rapamycin protein binds to a protein complex known as the mammalian target of rapamycin. The rapamycin-FK binding protein 12-mammalian target of rapamycin complex blocks DNA and protein synthesis, resulting in arrest of cell cycle progression from G1 to S phase.1-3 A tacrolimus pretreatment regimen can effectively control acute rejection in rats that receive intestinal transplant.4 Rapamycin has been proven to be effective as an immuno­suppressant in controlling chronic rejection in murine models and nonhuman primates.5 This is mostly because of its ability to inhibit cell proliferation and neointimal hyperplasia.6 In this study, we used tacrolimus and rapamycin as sequential therapy to induce immunotolerance of intestinal graft. In 1953, immunotolerance was first named by Billingham and Medawar.7 The mechanisms of donor-specific tolerance (DST) induction are still not completely understood, and mixed chimerism was considered an attractive approach for DST. Bone marrow8,9 and splenocyte transplant10,11 were used to induce DST, allowing a better understanding of tolerance induction methods, which is critical for studies in transplant immunology to achieve allograft acceptance. Oluwole and associates12 found that CD25/CD4-positive regulatory T cells (Tregs) could maintain natural self-tolerance and T-cell homeostasis in the periphery. Further studies have shown that isolated CD25/CD4-positive Tregs have regulatory properties and can be expanded in vitro without loss of function.13,14 Human Tregs express cytotoxic T-lymphocyte antigen 4 immunoglobulin (CTLA4-Ig), and some studies have shown that CTLA4-Ig injection could induce DST.15,16 Recently, Qureshi and associates17 found that this was an essential negative regulator of T-cell immune responses, although the mechanisms of its action are still debatable. Natural killer (NK) T cells are a subset of T lymphocytes that coexpress NK cells and T-cell markers.18 These are thought to regulate immune responses and to play important roles in the induction of allograft tolerance. Natural killer T cells may also be related to the development of graft-versus-host disease. In 1971, Monchik and Russell established the classical intestinal transplant model.20 Over time, modifications have been made to this model to shorten procedure time and increase survival rate.21-25 However, intestinal transplant has had a slower development versus other organs because of its complexity and severe immune response.26 Heart transplant models can be established by several surgical methods, such as the abdominal double vascular anastomosis model of Ono and Lindsey,27 the abdominal single artery anastomosis model of Lee and associates,28 and the double cuff vascular anastomosis model of Heron.29 In this study, we transplanted secondary hearts to rats that had undergone intestinal transplant. This procedure has not been previously reported. Immunotolerance is generally determined by detecting the concentration of cytokines or studying the long-term survival of recipients rather than the ability of recipients to accept new organs through secondary transplants. In this study, secondary abdominal heart transplant was performed to induce DST in long-term surviving intestinal transplant recipients, which had been established under different treatment regimens. This model was meant to demonstrate DST, with the goal of revealing DST mechanisms. Inbred Fisher F344 (RT1lv) rats weighing 180 to 220 g were used as donors. Lewis (RT1l) rats weighing 180 to 250 g were used as recipients. 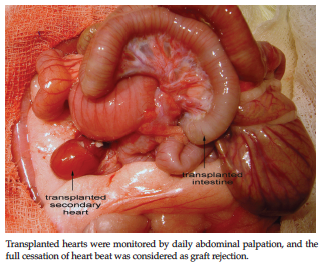 Lewis rats received abdominal secondary heart transplant 120 days after intestinal transplant. Group A had heart donations from F344 rats, and group B had heart donations from Brown Norway rats (RT1n), acting as a third-party donor. All animals were obtained from Vital River (a Charles River Laboratory Company, Beijing, China). Rats were allowed free access to food and water in a room with 12:12-hour light-dark cycle. All experi­ments were conducted in accordance with the Chinese Council on Animal Care guidelines. The donors and recipients were fasted for 24 hours with water only before transplant. Animal death within 5 days after transplant was regarded as surgery-related death, with these rats excluded from analyses. All procedures were conducted under a microscope (Carl Zeiss, Oberkochen, Germany). Microsurgical intra-abdominal orthotopic intestinal transplant was performed according to a modi­fication of the method of Monchik and Russell.20 The arterial anastomosis was established through the superior mesenteric artery graft to the abdominal aorta. The venous drainage was made through the superior mesenteric vein to the inferior vena cava (Figure 1). Intra-abdominal heterotopic cardiac transplant was performed according to a modification of the method described by Ono and Lindsey.27 At 120 days after intestinal transplant, hearts were transplanted. The pulmonary artery was anasto­mosed to the vena cava, and the aorta was anastomosed to the recipient’s abdominal aorta. Artery bleeding and venous obstruction were avoided. Animals were checked every day. 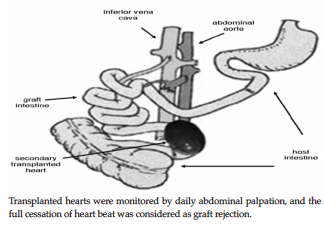 Grafts that lost palpable heart beat were regarded as rejected (Figures 1 and 2). Hematoxylin and eosin staining studies were performed to examine changes in tissue architecture under standard light microscopy (at ×100 and ×400 magnification). ED1 antibody was used to demonstrate mac­rophage infiltration by immunohistochemistry in both groups, and normal Lewis heart was used as control. ED1-positive cells were counted in five ×400 magnification fields, with results expressed as means ± standard deviation. 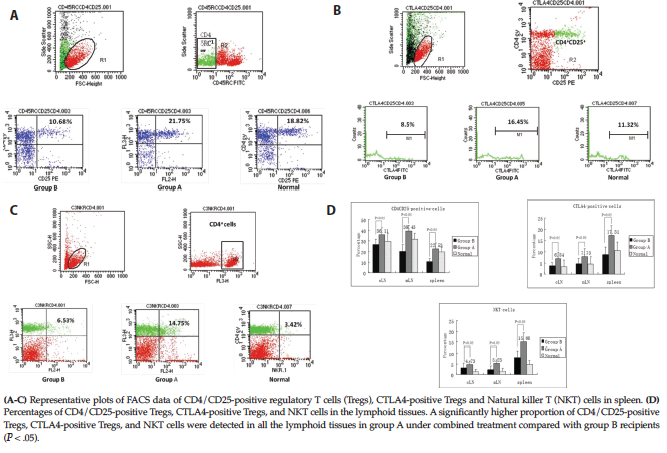 Fluorescence-activated cell sorting was performed to investigate chimerism by detecting the production of CD4/CD25-positive Tregs, NK T cells, and CTLA4/­CD4/CD25-positive Tregs in recipient lymphoid tissues, including cervical lymph nodes, mesenteric lymph nodes, and spleen of both groups and normal rats. The transplanted hearts continued beating for more than 30 days after transplant in group A, but the hearts stopped beating after 10 days (8.5 ± 1.5 d) in group B, with significant difference between the 2 groups (P < .01) (Table 1 and Figure 3). Both groups showed muscle damage and cellular infiltration in the hearts, although these results were not significantly different between the 2 groups (Figure 4). 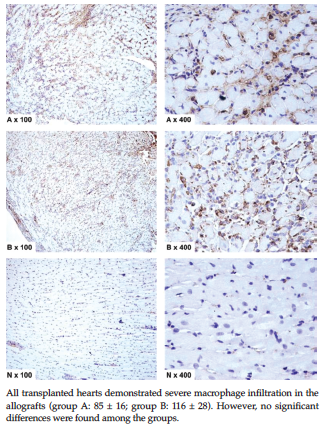 However, secondary Brown Norway transplanted hearts with acute rejection showed mild muscle damage and cellular infiltration compared with normal Lewis rat hearts. In addition, secondary transplanted Fisher F344 hearts displayed comparable muscular damage and severe cellular infiltration versus Brown Norway rejected hearts. Secondary transplanted Fisher F344 hearts at 30 days after transplant also showed muscular damage with relatively low density of cardiac muscle and severe cellular infiltration compared with normal Lewis hearts. There was little macrophage infiltration in normal Lewis hearts. 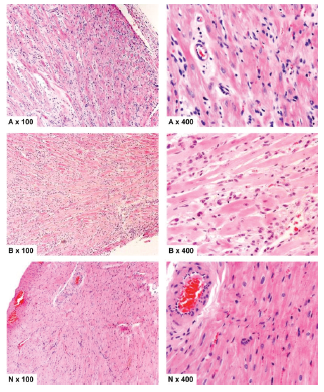 In contrast, all of the transplanted hearts demonstrated severe macrophage infiltration in the allografts (Brown Norway heart: 116 ± 28; Fisher F344 heart: 85 ± 16), with no significant differences among groups (P > .05) (Figure 5). The CD45RClow cell population, which represents a subpopulation of active Tregs, was gated, showing CTLA4-positive cells and NK T cells gated by CD4/CD25-postive cells and CD4-positive cells. Representative plots of FACS data of the spleen in different groups are shown in Figure 6A-C. Percentages of the 3 kinds of cells in the spleen, in cervical lymph nodes, and in mesenteric lymph nodes were determined and shown in Table 2. Group A rats had significantly higher levels of the 3 kinds of cells compared with group B rats, showing that existence of CD4/CD25-positive Tregs, CTLA4-positive T regs, and NK T cells in intestinal transplant recipients was associated with allograft survival and perhaps contributing to DST induction (Figure 6D; P < .05). Studies of secondary abdominal heart transplants in an intestinal transplant model have thus far not been reported. Here, we used the classical intestinal transplant model with manual suture and made vascular reconstruction through an end-to-side suture, transplanting only the small bowel to avoid complications.30 The classical model requires a high level of suture techniques compared with other models. During the procedure, it was important to keep the 2 blood vessels sutured to the upper aorta and the inferior vena cava. This would leave enough space for the heart transplant. For the secondary heart transplant, we followed the method described previously by Ono and Lindsley,27 which was proven reliable by Niimi.31 Our secondary heart was transplanted in the abdominal and not the cervical region, allowing enough space for the graft and more space for the surgical procedure compared with the Heron model, as the heart would not be constrained or scratched by the animal recipient after the procedure. For heart transplant after intestinal transplant, abdominal adhesions would occur; therefore, a swab with normal saline was a useful tool to blunt the separate adhesions and avoid sur­rounding tissue injury. This model had a remarkable advantage, as we could judge whether rejection occurred by touching instead of cytokine assays when the heart stopped beating. To investigate DST mechanisms, secondary skin transplant had often been used because of its relatively simple procedure and because it was easy to observe.32,33 However, skin is not a vascularized organ, and the mechanisms of DST induction in skin allograft might be different from vascularized organs,33,34 such as in the heart. In this study, a novel treatment regimen was established, using tacrolimus and rapamycin as a sequential treatment. Tacrolimus and rapamycin bind to the same family of intracellular receptors (FK binding protein 12) and antagonize the activities of each other in in vitro assays. It is not advisable to administer these 2 drugs simultaneously; instead, these drugs were given sequentially. However, whether the sequential treatment affected DST needs further exploration. Survival data showed that the rats regarded the secondary transplanted F344 heart as self without evoking allograft rejection, indicating establishment of DST. However, hematoxylin and eosin staining and immunohistochemistry showed that there was no significant difference between the 2 transplant groups. This result implied that the recipients did not totally accept the secondary heart as “self” and still evoked an immune response, as there was a degree of tissue damage to the secondary allograft. However, the allografts had distinct fates, and the immune response was not strong enough to cause allograft rejection in group A. The different outcomes of the allografts could be attributed to the following reasons: (1) infiltrating cells may have secreted one factor playing different roles and/or (2) infiltrating cells may have secreted different factors in 2 distinct situations. Therefore, it can be speculated that DST is a state of “clinical tolerance” instead of “immu­nologic tolerance.” It is questionable whether immunologic tolerance truly exists, especially with drug-induced tolerance. However, it is true that the immune responses of our animal recipients receiving secondary transplant may be mechanically different from the immune response during the primary transplant, in which recipients are exposed to alloantigens. The existence of donor-derived cells in the lymphoid tissues of recipients may favor allograft survival and tolerance induction. Microchimerism leading to T-cell anergy of recipients might be necessary for recipients free from chronic rejection development. Relatively high levels of CD4/CD25-positive Tregs were found in group A, and the suppressive effect of CD4/CD25-positive Tregs may play an important role in tolerance induction. CTLA4/CD4/CD25-positive Tregs may be a particular cell population of Tregs, and the up-regulated expression of CTLA4 on CD4/CD25-positive Tregs may be directly associated with allograft acceptance and tolerance induction. The increased number of NK T cells in group A indicates the importance of this cell population in the induction and maintenance of DST. How the 3 kinds of cells take part in the DST process needs further investigation. The elucidation of differences in immune responses between primary and secondary trans­plant could be critical and could lead to development of a strategy for controlling alloimmune responses in transplant rejection and tolerance induction. Our abdominal heterotopic secondary heart trans­plant rat model after orthotopic intestinal transplant was successful. It was shown to be a feasible and efficient technique to test DST in rat intestinal transplant and also a perfect model for studying the secondary alloimmune responses both histologically and immunologically. The results showed that DST existed but possibly as a state of clinical tolerance. The use of tacrolimus and rapamycin as sequential treatment was reliable in suppressing immune rejection, and the existence of CD4/CD25-positive Tregs, CTLA4/CD4/CD25-positve Tregs, and NK T cells in intestinal transplant recipients was associated with allograft survival, which may contribute to DST induction. Abraham RT, Wiederrecht GJ. Immunopharmacology of rapamycin. Annu Rev Immunol. 1996;14:483-510. Terada N, Lucas JJ, Szepesi A, Franklin RA, Domenico J, Gelfand EW. Rapamycin blocks cell cycle progression of activated T cells prior to events characteristic of the middle to late G1 phase of the cycle. J Cell Physiol. 1993;154:7-15. Sigal NH, Dumont FJ. Cyclosporin A, FK-506, and rapamycin: pharmacologic probes of lymphocyte signal transduction. Annu Rev Immunol. 1992;10:519-560. Guo WH, Tian L, Dallmann MJ, Tam PK. Comparative study of allograft survival of heterotopic and orthotopic small bowel transplantation in rat. Transplantation. 2003;75(11):1895-1897. Dambrin C, Klupp J, Bîrsan T, et al. Sirolimus (rapamycin) monotherapy prevents graft vascular disease in nonhuman primate recipients of orthotopic aortic allografts. Circulation. 2003;107:2369-2374. Marx S, Jayaraman T, Go L, Marks A. Rapamycin-FKBP inhibits cell cycle regulators of proliferation in vascular smooth muscle cells. Circ Res. 1995;76(3):412-417. Billingham RE, Brent L, Medawar PB. Actively acquired tolerance of foreign cells. Nature. 1953;172(4379)603-606. Kanamoto A, Monaco AP, Maki T. Active role of chimerism in transplantation tolerance induced by antilymphocyte serum, sirolimus, and bone-marrow-cell infusion. Transplantation. 2004;78(6):825-830. Li Z, Xu X, Weiss ID, Jacobson O, Murphy PM. Pre-treatment of allogeneic bone marrow recipients with the CXCR4 antagonist AMD3100 transiently enhances hematopoietic chimerism without promoting donor-specific skin allograft tolerance. Transpl Immunol. 2015;33:125-129. Kutsuna N, Yamazaki S, Kaiga T, et al. Chimeric acceleration by donor CD4+CD25+T-reg depleted fraction in splenocyte transplantation. J Surg Res. 2012;178(1):133-138. Hara H, Lin YJ, Tai HC, et al. Hematopoietic chimerism following allotransplantation of the spleen, splenocytes or kidney in pigs. Transpl Immunol. 2014;31(3):125-133. Oluwole SF, Oluwole OO, DePaz HA, Adeyeri AO, Witkowski P, Hardy MA. CD4+CD25+ regulatory T cells mediate acquired transplant tolerance. Transpl Immunol. 2003;11(3-4):287-293. Levings MK, Sangregorio R, Roncarolo MG. Human cd25(+)cd4(+) t regulatory cells suppress naive and memory T cell proliferation and can be expanded in vitro without loss of function. J Exp Med. 2001;193(11):1295-1302. Hoffmann P, Eder R, Kunz-Schughart LA, Andreesen R, Edinger M. Large-scale in vitro expansion of polyclonal human CD4(+)CD25high regulatory T cells. Blood. 2004;104(3):895-903. Russell ME, Hancock WW, Akalin E,et al. Chronic cardiac rejection in the LEW to F344 rat model. Blockade of CD28-B7 costimulation by CTLA4Ig modulates T cell and macrophage activation and attenuates arteriosclerosis. J Clin Invest. 1996;97(3):833-838. Kosuge H, Suzuki J, Gotoh R, et al. Induction of immunologic tolerance to cardiac allograft by simultaneous blockade of inducible co-stimulator and cytotoxic T-lymphocyte antigen 4 pathway. Transplantation. 2003;75(8):1374-1379. Qureshi OS, Zheng Y, Nakamura K, et al. Trans-endocytosis of CD80 and CD86: a molecular basis for the cell-extrinsic function of CTLA-4. Science. 2011;332(6029):600-603. Bendelac A, Savage PB, Teyton L. The biology of NKT cells. Annu Rev Immunol. 2007;25:297-336. Haraguchi K, Takahashi T, Hiruma K, et al. Recovery of Valpha24+ NKT cells after hematopoietic stem cell transplantation. Bone Marrow Transplant. 2004;34(7):595-602. Monchik GJ, Russell PS. Transplantation of small bowel in the rat: technical and immunological considerations. Surgery. 1971;70(5):693-702. Wallander J, Holtz A, Larsson E, Gerdin B, Lackgren G, Tufveson G. Small-bowel transplantation in the rat with a nonsuture cuff technique. Technical and immunological considerations. Transpl Int. 1988;1(3):135-139. Zhong R, Grant D, Sutherland F, et al. Refined technique for intestinal transplantation in the rat. Microsurgery. 1991;12(4):268-274. Soin AS, Friend PJ. A modification to improve technical success rate of small bowel transplantation in rats. Transplant Proc. 1996;28(5):2722. Zhang XQ, Sun JL, Ma R, Fan ZY, Dai Y, Sun JZ. Simplified techniques in rat heterotopic small bowel transplantation. Transplant Proc. 2006;38(6):1840-1841. Li Y, Zhu L, Li J. Two-step procedure of whole orthotopic intestinal transplantation in rats: considerations of techniques and graft functional adaptation. Microsurgery. 2006;26(3):399-403. Pecora RA, David AI, Lee AD, Galvao FH, Cruz-Junior RJ, D'Albuquerque LA. Small bowel transplantation. Arq Bras Cir Dig. 2013;26(3):223-229. Ono K, Lindsey ES. Improved technique of heart transplantation in rats. J Thorac Cardiovasc Surg. 1969;57(2):225-229. Lee S, Macedo AR, Curtis GP, Lee D, Orloff MJ. A simplified model for heterotopic rat heart transplantation. Transplantation. 1982;33(4):438-442. Heron I. A technique for accessory cervical heart transplantation in rabbits and rats. Acta Pathol Microbiol Scand A. 1971;79(4):366-372. Weih S, Kessler M, Fonouni H, et al. Review of various techniques of small bowel transplantation in pigs. J Surg Res. 2011;171(2):709-718. Niimi M. The technique for heterotopic cardiac transplantation in mice: experience of 3000 operations by one surgeon. J Heart Lung Transplant. 2001;20(10):1123-1128. Otomo N, Margenthaler JA, Motoyama K, et al. Organ transplant specificity of tolerance to skin grafts with heart or kidney grafts plus nondepleting anti-CD4 monoclonal antibody (RIB 5/2) and intravenous donor alloantigen administration. J Surg Res. 2001;98(1):59-65. Trentadue G and Dijkstra G. Current understanding of alloimmunity of the intestinal graft. Curr Opin Organ Transplant 2015;20:286-294. Bektas H, Jorns A, Klempnauer J. Differential effect of donor-specific blood transfusions after kidney, heart, pancreas, and skin transplantation in major histocompatibility complex-incompatible rats. Transfusion. 1997;37:226-230. Acknowledgements: The authors have no conflicts of interest to declare. The work was supported by the 12th Five-year National Science and Technology Support Plan (grant numbers 2012BAI04B05).